LetsGoPens.com • View topic - A little consolation? Badger Bob wrote: I'm conflicted. I've been leaning toward wanting to see the Caps make it to the Finals against the Golden Knights and MAF just owning them again. That would be pretty awesome. Then again, the closer they get to the cup, the more nervous I feel. So part of me wants them to pull a Caps choke job this round. Take pleasure in seeing Kunitz eliminate them again. Good enough for me. I'm not conflicted at all - the sooner the Caps lose the better!! To me it's as simple as this.....If they make it to the finals they could win, if they don't it's another season of disappointment and not Cup for Ovie. Badger Bob wrote: Wilson is all about public denial. Always trying to justify his own actions. IMO, Trotz loves his style of dirty play and probably encourages it to some degree. Trotz certainly does when he says, looks like a clean hockey play to me after ZAR gets his jaw busted up. What Trotz could say is, I haven't looked the tape yet in too much detail to make a judgement, I'll let the league work it out. djlm wrote: ! the caps. I hate this "Ovie deserves his cup" crap. The cup is earned, not deserved. Well, he's earning it now. Isn't he? I wouldn't be upset about Ovi winning a cup. Now Ted Leonsis getting his name etched on the cup, is another story. As long as he's the owner I hope for gut wrenching playoff losses every year. A man after my own heart. Ever since he sent that letter to ticket holders about how the Pens won theirs, now it's our turn. No Sweaty Teddy, you don't take turns, you earn it. I don't want the Caps in the finals, I want them to lose as soon as possible. One thing is, if they get to the finals and lose, they still get the experience to have been there, like we did in 2008, and then we won the year after, I don't want them to get that for next season. San Jose had the experience of being there two years ago. What'd that gain them? Same with Nashville last year. In fact, if I'm reading it right, the Pens in 2008 are the last runner-up to win the next year. But you are right, they are the Caps. And having lived in that area for a couple of years, I take great joy in their annual pain. LimerickPensFan wrote: San Jose had the experience of being there two years ago. What'd that gain them? Same with Nashville last year. In fact, if I'm reading it right, the Pens in 2008 are the last runner-up to win the next year. No off course a loss at the finals don't guarantee a win next year, but, it could help a bit, it gives experience, and a hunger to be so close. In a final series, the emotions runs high and to have been there before, is good, to know what to expect. Since it has only happened once out of the last ten seasons, I think we're a little beyond "don't guarantee". no name wrote: From watching it, Holtby vs Vasilevkiy is the mismatch. The Vas looks lost at times. Okay, I held back from commenting then, but now, after Vasilevskiy won stole a game for TB last night, to tie the series on the road. I'm calling them even, flip the coin. Yea sure, if you want to do word-picking. But, you are saying then, that a player gains NOTHING from being in a Stanley cup final and losing? It don't give him more motivation for next year? He don't learn to handle the pressure at all any better than if he had been playing golf instead? It's possible that they gain a little, but even the first round of the playoffs gives them that type of experience to a lesser degree. What it does give them is a two-week shorter offseason with nothing to show for it. If you look at the Pens in 2016 and 2017, the team - basically the same players - was not nearly as good in 2017, even though they won. They didn't have that look of just completely stunning other teams with speed. I think the long season the year before had something to do with that. plus it gives them an Eastern conference champions banner rather than all those regular season banners, we can't have that happening. I think this series will be won by the first team to win on home ice. What is it with this year's playoffs and poor performance at home? For whatever reason last night felt like TB as on the PK all night. If they can stay out of the box they will win this series. The Caps offense seems to be all on the PP. Don’t forget their Winter Classic banner. Plus this year they get the Metro Champions Banner. At this rate they'll have to begin retiring some to make room for new ones. I'd be very happy with that outcome. I was surprised to see TB find their courage and win 2 games on the road. I hope they can keep it together. I'd like to see the Caps lose and then TB lose to Vegas in the Finals. Oh, before the EC series is over, could someone put Tom Wilson into Row C, preferably head first? pekkasteele wrote: I don't want the Caps in the finals, I want them to lose as soon as possible. Poor Washington. They were so confident after going up 2-0. Shouldn’t have given Tampa Bay life. Weegie wrote: The Caps are really pushing the Bolts around like a shopping cart at the grocery store, Pens gave them much more fight than they are so far. Maybe it is matchups, maybe the Caps are inspired since they finally got past their nemesis, but it is a little consolation to know the Pens hung in there closer than the Bolts are, didn't see this one coming I don't think anyone did. It doesn't change anything but at least we didn't get whacked like Tampa is so far! A legitimate question on May 14 but Tampa has nullified it, IMO, regardless of how the series ends. Beautiful, isn't it? 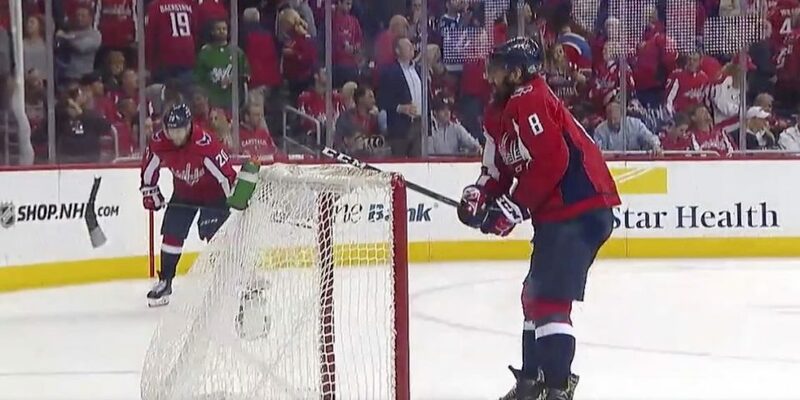 The Caps thought their issues were over when they finally conquered their arch enemy, now they are in a downslide and you can just see it they don't know how to stop it!! !